Representing SUNCO LLC, attorney James Mello made a presentation to the Maplewood Plan and Zone Commission on April 4. The presentation covered the revised concept plan for the Sunnen site which will include a relocated Mini dealership and commuter parking lot. 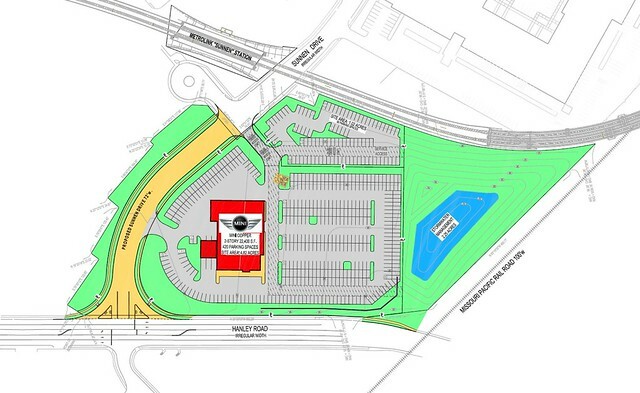 A rendering of the dealership can be seen above; the site plan can be seen below. While the site was billed as the perfect opportunity for transit-oriented in 2008, the current site plan with its 500+ parking spaces shows the development will be nothing of the sort. Revised concept plan. // City of Maplewood. Will never understand why New Town St. Charles, and now Jamestown Mall, get planned as TND in remote locations, yet Maplewood Commons, and now this Mini dealership, go right beside MetroLink. What a waste!